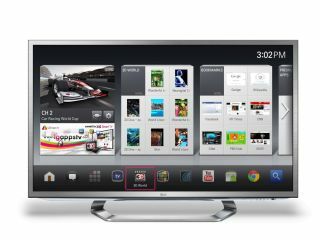 LG has announced that it will introduce a television with integrated Google TV at CES 2012, a key step for both companies as they look to a connected future. Along with LG, Google has also confirmed that Sony and Samsung will be revealing new Google TV devices at the Vegas tech show, although it's sufficiently vague enough to conceal whether they'll be integrated TVs or just set top boxes. LG's take on Google TV has been eagerly anticipated, with the Korean giant keen to bring in Google's Android-based IPTV platform and pair it up with its 3D and Smart TV technologies. "LG has constantly strived to provide consumers with wider choices in home entertainment that bring the highest level of sophistication and convenience," said Havis Kwon, President and CEO of LG Electronics Home Entertainment Company. "Through Google TV, LG has merged Google's established Android operating system with LG's proven 3D and Smart TV technologies, offering consumers a new and enthralling TV experience," he added. The LG Google TV will feature a 'magic remote QWERTY' designed by LG and an extension of its current magic remote, but use the Google TV user interface on screen. The integrated television will also feature LG's well-established passive Cinema 3D technology, which allows 3D conversion from a 2D source. Interestingly, LG is not leaving out its own NetCast-based Smart TV offering, although it replicates much of the Google TV functionality. "With a growing collection of content and services, LG's Smart TV platform will continue to provide consumers with a unique user experience." Our lucky compadres in the US will see an the integrated Google TV launching in 2012. On this side of the Atlantic we'll have a longer wait for our LG Google TV UK release date, which isn't going to be until 2013.